Experts on the science of success know that the brain is a goal-seeking organism. Whatever personal goals you give to your subconscious mind, it will work night and day to achieve them. However, one goal isn’t good enough. Some goals take longer to achieve than others – and if you spend years working toward only one objective, you’re likely to get discouraged when it doesn’t happen right away. But when you have a long list of goals you’d like to achieve, you have more to strive for, and more opportunities to check those goals off your list. And the rush you feel every time you check one of those goals off the list will inspire you to accomplish even more of them. As my friend Brian Tracy says, SMART goals are essential to motivating yourself and others to achieve success. I absolutely agree with him and – as many of you can attest – I encourage everyone to start with a list! What goals do YOU want to achieve in your lifetime? Make a list of 101 goals you’d like to achieve in your life. Be as specific as possible. Include details such as when they will happen, where they will happen, how much you’ll make, what model you’ll buy, what size it will be, and so on. Keep your goals somewhere you can review them often. You might want to put them on a deck of 3”x5” cards you shuffle through every morning, on a poster or piece of paper you hang on the wall beside your computer, or in a book you read each night before you fall asleep. By keeping them top of mind, you’ll be more likely to make them a reality. And every time you achieve one of your goals, check it off the list and celebrate what you’ve managed to accomplish in your life! Here’s my list – and examples of the goals I’ve achieved so far are in bold font. Appear in a movie (The Secret, 2006; The Opus, 2009; The Tapping Solution, 2009; Beyond Belief, 2009; The Truth, 2010; The Gift, 2010; The Keeper of the Keys, 2012). I wrote this list back in 1989 at the age of 45 – and I’m proud to say that I’ve crossed more than a few goals off the list – 80 to be exact! To have a date night with my wife Inga every week that I am home and not on the road. To work out using High-Intensity Interval Training and weightlifting for at least 30 minutes a day a minimum of 3 days a week. To read books on personal, spiritual or professional development for a minimum of 30 minutes a day. To watch two TED or TEDx talks every week. To tithe 10% of my after-tax income to nonprofit organizations including The Unstoppable Foundation, Child Abuse Learning and Mediation, The Bodhi Path Meditation Center, The Pachamama Alliance, UNICEF Children’s Fund, Doctors Without Borders, and Direct Relief. To provide one free online Train the Trainer program to someone in a third world country for every one we sell. Once you’ve completed your list, please share some of your own personal development goals and professional goals in the comments below. I’d love to read them! Most of us have big dreams for our lives. We yearn to create joyous, abundant, and meaningful existences for ourselves. We want to experience deep love and friendship. We want to feel mentally and physically strong, completely healthy, and financially secure. And we want to know that we’re great at what we do – and that we’re making a positive impact on the world. 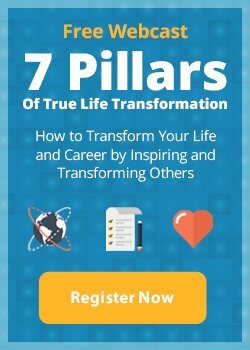 I’ve created a webinar called the 7 Pillars of True Life Transformation that will help you learn exactly how to live the life that you’re meant to live.